I am fascinated by the sky – both by its subtle, transitory qualities, and by its ability to alter the landscape. 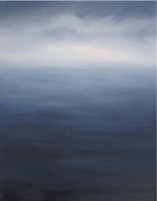 Much of my work is focused on the atmospheric relationship between the sky and the attendant land and sea. In my work, I strive to integrate these realms through my use of atmosphere for both perceptual and metaphorical purposes. Through skies, I seek to allude to the infinite province of the Divine. I reference my own environment by the depiction of places that are important to me. I am interested in water both as a perceptual and as a symbolic subject. Water is ultimately the origin of atmosphere, thereby interrelating land, sea, and sky. As an oil painter and a pastel artist, I find that one medium often informs the other. I attempt to utilize my media to most effectively convey my ideas.